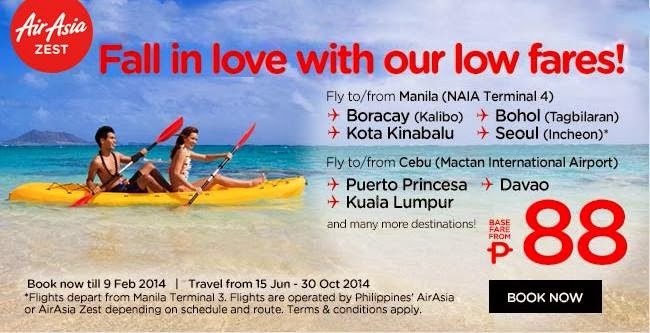 Air Asia Promo: Hello February! Let’s welcome this love month with a sweet promo, shall we? P88 base fare sale to all our destinations! Have your ultimate getaway to our awesome destinations! Fly to/from Manila (NAIA Terminal 4), Cagayan de Oro, Cebu, Davao, Kalibo (Boracay), Puerto Princesa and Tagbilaran from as low as P635 all-in fares! Or go international and fly to/from Manila, Kuala Lumpur, Kota Kinabalu, Miri, Macau, Shanghai & Seoul (Incheon) from as low as P668 all-in fares! For our Cebu Hub, you can also fly to/from Cagayan de Oro, Davao, Puerto Princesa, Kuala Lumpur and Kota Kinabalu from as low as P688 all-in fares! ‘Share’ this promo with your family and friends now and grab a hold of our fares so low, you’ll fall in love! Promo Fare at Php 6 as Base Fare!